“You have five new messages… Message 1…” How many times have you heard your voicemail system tell you that, only to sit there, being a slave to crappy technology, as you play each message? And of course, message 5 would be that call you’ve been waiting for from a major account saying, yes, they could talk to you, but you have to call them back now before they leave on an 8-day trip to China… only they’ve already left. I hate voicemail. Leaving it, playing it, trying to remember more commands that save and delete (which they change every so often just for the fun of it.). Well, that’s over with for 2010. Today, either for free or cheaper than your current voicemail system you can have a much better experience. Let’s first look at Google Voice (I have 3 invites left if you need one). Here are the pros/cons of Google Voice as I see them. One of the biggest pros of GV is that I can set up multiple phone numbers for our single main number to ring to. So I can have team members all over the place and whoever answers the phone gets it, but we all know the phone rang. 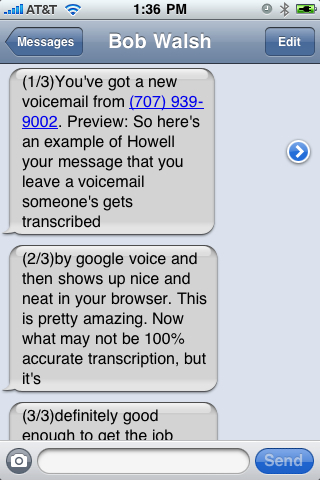 You can have all of your normal voicemail for a phone number (cell phone, etc.) go to Google Voice. You can access your voice mail online or via your smart phone, and get an email or SMS when you have a voice mail. You can set up groups of numbers and have different greetings for the different groups. 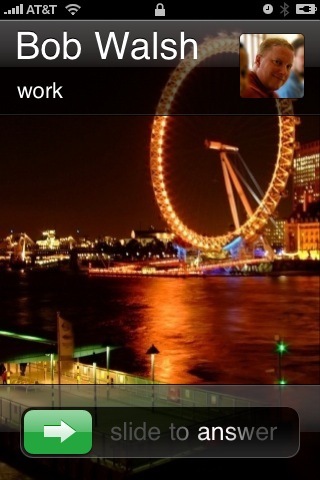 Add a call widget to a web page so people can easily initiate a call to you. The only con as I see it is that you can’t set up times for the service to ring different phones. In other words, I can’t tell it to ring one number from 8-5, and another after that. And for that matter, it’s in my GV interface online. Was it a perfect transcription? No. But digitally good enough to let you decide whether this was a file and forget or your house is burning down. Bottom Line: ditch analog-like voicemail for 2010 – it makes about as much sense as a horseless carriage. You actually can tell Google Voice when to ring certain numbers during certain hours. Click ‘Edit’ on the number you want to edit and expand the ‘Advanced Settings’. There are three radio buttons each for weekdays and weekends, ‘Always’, ‘Never’, and ‘Custom’. Choose ‘Custom’ and you can set your daily schedule. The google voice benefits of a regular cell phone are great, but with Android it would blow your mind. I can make calls from my GV number, text from it (free) and also receive and check voicemail on the phone. It’s a bummer that Apple has denied GV so far. If you ever get a chance to try out the GV app on Android I highly recommend it. 3. I can designate different messages to my friends vs. people I don’t know. I’d love to have one of those invites if you have any left! If you still have some invites left, I would be pleased to have one.